Previous NATS statements on the Icelandic volcanic eruption can be found archived here. The Civil Aviation Authority (CAA), the UK’s independent specialist regulator with oversight of aviation safety, today issues new guidance on the use of airspace. This is issued in conjunction with the Irish Aviation Authority (IAA) and covers the Anglo Irish Functional Airspace Block (FAB). The new guidance allows a phased reintroduction from 2200 tonight [i.e. 21:00 GMT] of much of the airspace which is currently closed due to the volcanic ash plume over the UK. There will continue to be some ‘no fly zones’ where concentrations of ash are at levels unsafe for flights to take place, but very much smaller than the present restrictions. Furthermore, the Met Office advise that the ‘no fly zones’ do not currently cover the UK. The major barrier to resuming flight has been understanding tolerance levels of aircraft to ash. Manufacturers have now agreed increased tolerance levels in low ash density areas. Our way forward is based on international data and evidence from previous volcanic ash incidents, new data collected from test flights and additional analysis from manufacturers over the past few days. It is a conservative model allowing a significant buffer on top of the level the experts feel may pose a risk. If the authorities have this right, an end to the Great European Aviation Lockdown may be in sight. UPDATE: UK air traffic authority NATS promises a statement by 22:00 BST tonight. British minister of transport has announced that all UK airports will re-open from 22:00 BST, says the BBC. Dr Erik Klemetti of the Eruptions blog deserves some kind of award for his tireless coverage of the Eyjafjallajökull eruption. For an update on the latest from Iceland (as of 17 April 2010) you can’t do better than this. UPDATE 19 April 2010. A new Eyjafjallajökull post from Erik here: Airlines lobby to reopen European airspace closed by Eyjafjallajökull (and 300+ comments as well). A very useful up-to-date collection of links related to the Eyjafjallajökull eruption can be found here: Eyjafjallajokull links / Liens à propos de l’Eyjafjallajokul. Thanks to Michel of the French-language Islande 2010 blog (where there is much more Eyjafjallajökull coverage) for putting this collection together. Meteosat image of the Iceland ash cloud, 07:00 GMT on 15 April 2010. Click on the image for the EUMETSAT source page. The ash cloud from the Eyjafjallajökull-Fimmvörduháls eruption in southern Iceland has reached the British Isles and is having a severe impact upon air travel to and from UK and Irish airports. According to London VAAC the plume is reaching altitudes of 6-11 km and stretches across much of northern Britain. Aberdeen, Edinburgh and Glasgow airports in Scotland are all currently closed, and in England and Wales traffic at Birmingham, Bristol, Cardiff, East Midlands, Leeds Bradford, Liverpool, Manchester, Newcastle and London’s Gatwick, Heathrow and Standsted airports being disrupted. Flights from Dublin and from Belfast’s airports have also been suspended. The flight disruption is affecting all North Atlantic flights, with the United States FAA reporting ‘most Trans-Atlantic flights’ affected this morning; and of course Iceland’s own air traffic is severely disrupted as well. Even the current British general election campaign is being affected by the flight disruption (cue lame references to seismic events and political faultlines). Click here for Meteosat imagery of the ash cloud. 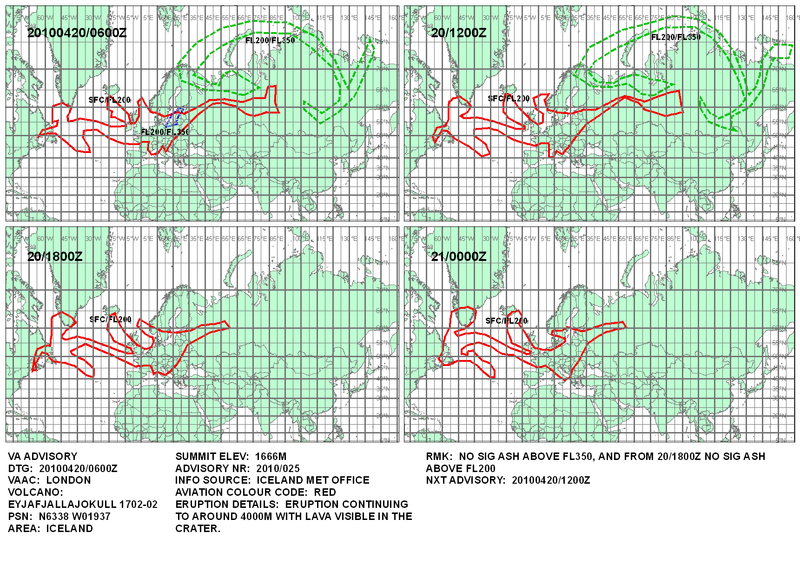 The UK Met Office model of the ash cloud’s spread between 1800Z on 14 April and 1200Z on 15 April can be found here. The 1200Z image is shown below; the different colour lines indicate the approximate area of the cloud at various heights: red = between surface and FL200 (6,000 metres), green = between FL200 and FL350 (between 6,000 and 10,600 metres), blue = between FL 350 and FL 550 (between 10,600 and 16,700 metres). From midday today until at least 6pm, there will be no flights permitted in UK controlled airspace other than emergency situations. This has been applied in accordance with international civil aviation policy. We continue to monitor the situation with the Met Office and work closely with airline customers and adjoining countries. We will review the situation later today to understand what further action will be required. The latest NASA satellite images of the resurgent Eyjafjallajökull-Fimmvörduháls eruption in southern Iceland can be found via the Rapid Response System site, and are very impressive. The detail above comes from this Terra MODIS image captured on 14 April 2010: the eruption plume (white in colour – almost entirely steam from melted ice and snow) can be seen blowing due east from the seat of the eruption at Fimmvörduháls. The area shown in the image is about 150 km wide.